New Zealand, 1864, Queen Victoria "Chalon Head", 3d brown lilac, perf 12½, Large Star watermark, cancelled by manuscript "K" of Kowai, attractive warm color and clear impression, with comb perforations unusually skewed 3.5°, Very Fine and scarce cancellation; with 2015 Odenweller certificate. Scott No. 33d. Campbell Paterson No. A3d (1). SG No. 116 £650 ($850). The vertical skew of the impression with respect to the perforations is a result of a misalignment of the guide dots at the bottom of the plate. This is particularly noticeable on the comb-perforated brown-lilac shade. All other shades are line-perforated. New Zealand, 1864, Queen Victoria "Chalon Head", 3d brown lilac, perf 12½, Large Star watermark, distinctive color, tied by bold "070" oval duplexed with "Wellington, OC 24, 68" cds on small piece, Very Fine and attractive. Scott No. 33d. Campbell Paterson No. A3d (1). Joseph Hackmey, Spink Shreves, February 2009, lot 1394; with 1984 R.P.S.L. and 1988 Holcombe certificates. Scott No. 33d. Campbell Paterson No. A3d (1). SG No. 116 Estimate $1,000 - 1,500. 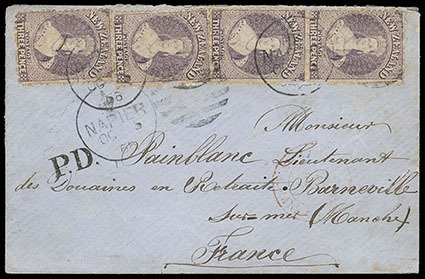 THE ONLY RECORDED USE OF THE 1864 3D BROWN LILAC PERF 12½ PAYING THE 3D INTERPROVINCIAL RATE. The 3d per ½ oz. 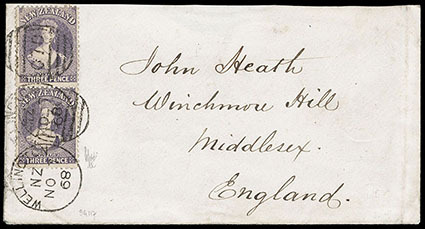 interprovincial letter rate was introduced January 1, 1867. This solo use of the 3d to prepay this new rate is a remarkable use. 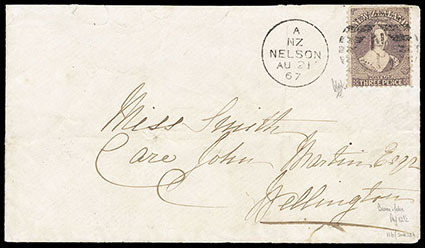 New Zealand, 1867, Queen Victoria "Chalon Head", 3d lilac, perf 12½, Large Star watermark, horizontal strip of 3 (R. 12/7-9) Pos. R. 12/8 showing plate flaw at top of "H", part o.g., beautiful strong color and clear impression, F.-V.F. and scarce plate flaw strip, Bernard Symonds, Spink, July 2007. Scott No. 33. Campbell Paterson No. A3d (3). SG No. 117 £510 as singles ($670). 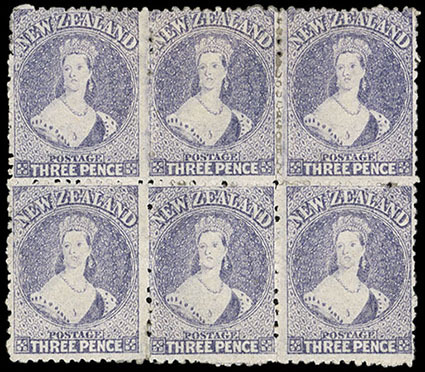 New Zealand, 1867, Queen Victoria "Chalon Head", 3d bluish lilac, perf 12½, Large Star watermark, top right corner margin block of 4 (R. 1-2/11-12) Pos. R. 2/11 with re-entry, o.g., hinge remnant, strong color, some gum toning, F.-V.F. and scarce position multiple showing re-entry. Scott No. 33. Campbell Paterson No. A3d (7). SG No. 117 Estimate $300 - 400. New Zealand, 1867, Queen Victoria "Chalon Head", 3d lilac, perf 12½, Large Star watermark, block of six, disturbed o.g., bright warm color, Very Fine and scarce mint block. Scott No. 33. Campbell Paterson No. A3d (3). SG No. 117 Estimate $500 - 750. 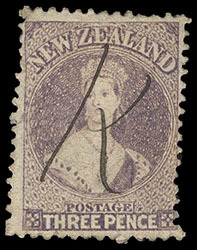 New Zealand, 1867, Queen Victoria "Chalon Head", 3d deep lilac, perf 12½, Large Star watermark, check plating, right margin block of 15 (R. 6-8/9-12) with watermark lettering in sheet margin, o.g., few small hinge remnants, well centered with rich vibrant color, strong intact perfs, couple trivial tone specks, fresh and Very Fine, Maurice Burrus, Robson Lowe, July 1963, lot 276. Scott No. 33. Campbell Paterson No. A3d (5). SG No. 117 Estimate $1,500 - 2,000. 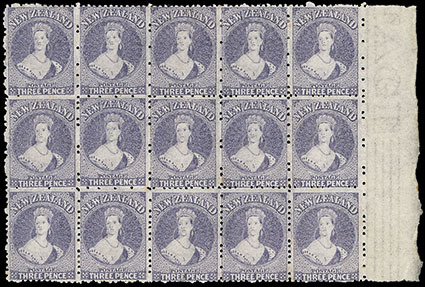 A REMARKABLE LARGE ORIGINAL GUM MARGINAL BLOCK OF THE 1867 3D DEEP LILAC PERF 12½. DuBois (Hiroaki Inoue), Matthew Bennett, May 2007, lot 2303; with 1988 Holcombe certificate. Scott No. 33. Campbell Paterson No. A3d (3). The certificate and prior auctions called one of the 2d singles as plate I showing intermediate wear, but is it actually plate II retouched (position R.18/3). 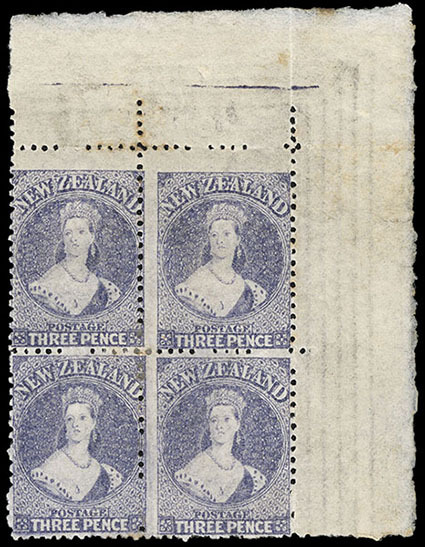 New Zealand, 1867, Queen Victoria "Chalon Head", 3d bluish lilac, perf 12½, Large Star watermark, vertical pair, strong color, tied by "Wellington, NO 7, 68" cds duplexed with "070" cancel on cover to Middlesex, England, red London (12.28) arrival backstamp; no back flap and opened at top, Very Fine use at the 6d rate via Panama to United Kingdom; signed Holcombe. Scott No. 33 var. Campbell Paterson No. A3d (7). SG No. 117 var. Estimate $150 - 200. 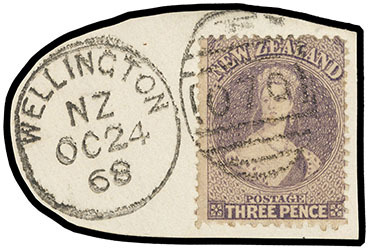 New Zealand, 1867, Queen Victoria "Chalon Head", 3d lilac, perf 12½, Large Star watermark, two singles and pair, tied by strikes of "Napier, OC 5 '68" duplex on blue cover to France, Dunedin (10.19) backstamp and sharp "P.D." handstamp, red French arrival cds, Dec 27th arrival backstamp; couple small stamp flaws, Very Fine and scarce 3d franking prepaying the ½ oz. letter rate to Europe via Trieste. Scott No. 33. Campbell Paterson No. A3d (3). SG No. 117 Estimate $1,000 - 1,500. ONE OF ONLY TWO RECORDED USAGES USING THE "VIA TRIESTE" ROUTE TO EUROPE.